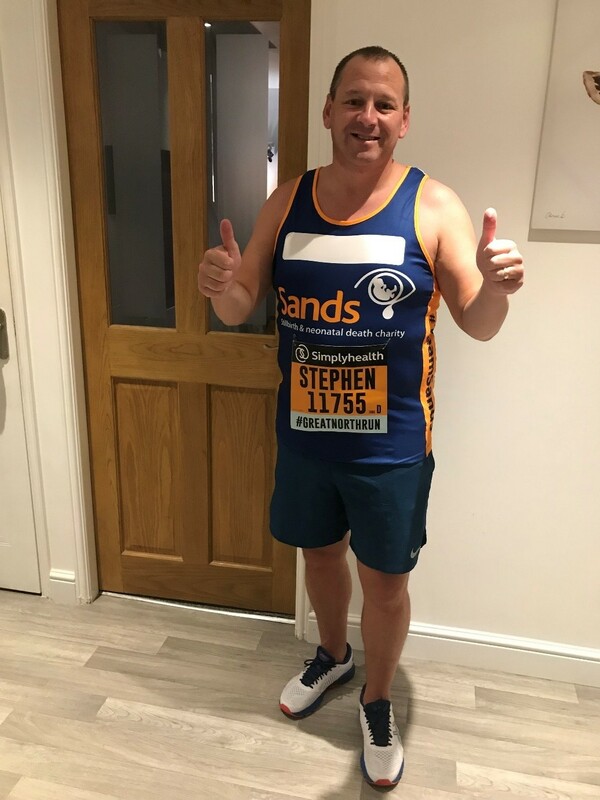 Stephen, from Merseyside, is running the Great North Run this Sunday. Here is his story and why he is running for Sands. On 23rd March 2002, after an exciting pregnancy for my wife Anita and I our beautiful daughter Tanya was born asleep. I say the pregnancy was exciting as we had not long married and were expecting a great future with our first child together. I am step Dad to Anita's first child who was also really keen to see his baby Sister and had shared his hopes too with his friends as he started School that year. On a routine visit 3 days ahead of the planned caesarean section at just over 39 weeks, there was no heartbeat to be found. Everything up to that point had been normal and baby was moving fine. Dread filled us as our lovely midwife had to say she was concerned and sent us straight to the hospital. At the hospital after a few scans, the worst news was confirmed and we were broken, we didn't know how or what to think and then to find we had to go through delivery filled us with more dread. The team at the hospital were amazing and allowed us some time to be with our lovely daughter, Tanya, who was perfect and a good weight. Looking back it would've been good to be able to spend more time cuddling and taking her picture but at the time this was a real shock so hard to react in a way you would if you had time to think about it. We received photos of Tanya from the hospital and I'm sure even more is done now to support parents and siblings at this worst time. Our son took the news badly and felt let down as we had promised him a Sister so sibling support is also needed to help the family cope. I have raised money for Sands and the hospital bereavement centre since this date and hope that one day the pain we went through and continue to feel will be a thing of the past. To conclude our story, Anita fell pregnant again, it seemed like a long time later as we were desperate to hold our baby but in reality our son Adam was born on 25th July 2003 so just 16 months had passed. He was 6 weeks premature as the Consultant had concerns he wasn't moving as much as he should and the same consultant had supported us with Tanya. Adam spent some time in special care and under the watchful gaze of the lovely midwives who were happy to see us back at the hospital after they had been there 16 months earlier. Adam was small but healthy. To be honest he doesn't move around a lot now at 15 so was probably just having a minute and we didn't need to panic! !